Once upon a time Abraham Hayden (the son of Sam Hayden, an entrepreneur and landowner from Yantley, Alabama, and Elizabeth Roberts Hayden) and his darling wife Louisa Johnson Hayden, originally from Whynot, Mississippi and the only daughter of Jonas Johnson (originally from Whynot, Mississippi) and Cammie Pearson Johnson (originally from South Choctaw County), established the Hayden & Butler Funeral Home in 1954. At the time of establishment, Hayden & Butler Funeral Home operated under the name of Hayden Funeral Home until approximately 1955 when the name changed to Hayden & Butler Funeral Home after Anthony Smith Butler joined his father-in-law, mother-in-law and wife in the family business. Abraham, being a natural born entrepreneur and community servant, was the visionary behind establishing the first African-American funeral home in Choctaw County, Alabama. Hayden and Butler (as it is affectionately known) remained the only African-American funeral home located in Choctaw County for nearly 38 years. Known to some as “Abraham” and to others “Mr. Abraham,” “Uncle Abraham,” “Cun Abraham,” “Cousin Abraham,” “Deacon Abraham,” or “Mr. Hayden,” Abraham (for several years prior to opening Hayden & Butler) engaged in numerous discussions with others in West Alabama to establish a partnership and open an African-American owned and operated funeral home. Unfortunately, those discussions did not lead to a partnership that could have been historical during the Civil Rights era. However, Abraham knew the need for African-American OWNED businesses (not just operated) to uplift African-Americans in the rural South and throughout the nation and would not let a setback stop his dream and vision for a better community for all people of West Alabama, East Mississippi, and beyond. Following a tragic accident in his home county and the concern regarding the response time taken to handle the situation, Abraham knew that he no longer could wait to answer one of God’s calls for him. Abraham worked with his wife and community in West Alabama and East Mississippi to start the first African-American owned and operated funeral home located in Choctaw County, Alabama, which served and continues to serve residents living in or connected to West Alabama and East Mississippi. Abraham and Louisa Hayden, being pillars in their community, received huge local, statewide and national support for Hayden & Butler, which has made Hayden & Butler a success for its 50 plus years of existence. The vision of the Haydens was for Hayden & Butler not to only operate as a burial business, but as a place of comfort and gathering for members of the community. True to this vision, the Hayden & Butler family prides itself on the fact that Hayden & Butler did and continues to serve as a place of comfort and gathering for its community. Following the marriage of Abraham and Louisa’s only child, Elizabeth Hayden Butler, to a local educator and political activist, Anthony Smith Butler, Anthony joined his in-laws and wife at Hayden & Butler, where Mr. and Mrs. Hayden and Mr. and Mrs. Butler served until their demise. In 1980 in an effort to better serve their community, Mrs. Hayden, the Butlers and their staff worked and relocated the facility for Hayden & Butler to its current location. 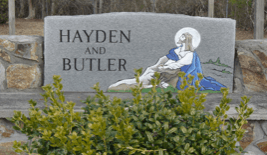 Although Abraham and Louisa Hayden and Elizabeth and Anthony Butler are no longer with us in body, the legacy of Hayden & Butler continues with the next generation. With the continued support, dedication and love of the community of West Alabama, East Mississippi and beyond, the desire and dream is to continue what Abraham and Louisa started during those turbulent times in the 1950’s for many generations to come as Hayden & Butler continues to be a landmark for its community. - Excerpt from On the State Line, a work by Seletha R. Butler.